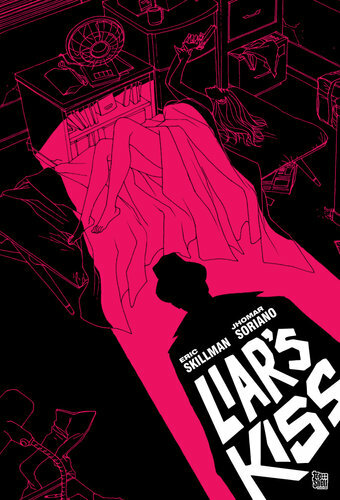 It’s cliché to say it, but LIAR’S KISS by Eric Skillman and Jhomar Soriano is the kind of noir tale that will keep you guessing until the very end. Essentially, the final twists and curveballs the creators throw at readers in the final pages are earned, as the narrative comes full circle, and all the dots connect. Sometimes it’s not about innovation; it’s about crystallising what makes a genre great; LIAR’S KISS perfectly encapsulates everything we love about hardboiled crime. Nick Archer is a private investigator with a sweet gig: he photographs pictures of his client’s wife to prove her faithfulness, while bedding her on the side. Win-win, right? Sure – until Archer’s client is murdered, and his wife is immediately the first suspect. Now Nick’s tasked with clearing her name – while fulfilling his own hidden agenda. There are no caption boxes; no monologs. Skillman leaves it up to Soriano to portray everything not articulated in the dialog, and he couldn’t have picked a better partner. Soriano’s artwork shifts from jagged black-and-whites to a softer greyscale, almost painterly style for the flashback sequences; in both instances, it’s excellent. While the final chapter successfully pulls together the various plot threads, the dramatic shift in storytelling approach – it takes the form of a confession – suggests Skillman had worked himself into a deep, dark plot hole – and this was his only way out. The first seven chapters are heavily plot-driven, and build up a head of steam; it feels like we’re heading towards a stunning climax, only for it to screech to a sudden halt. It’s an odd storytelling choice; but it’s not enough to detract from an overall compelling graphic novel.